I love searching through Ravelry's database of patterns. Right now, there are just over 180,000 patterns for JUST KNITTING projects on the site. I spend hours searching terms, flipping through options, and narrowing down my searches to find exciting potential projects. When I queue something, I immediately get excited about the potential yarn choices, project timeline, and I begin envisioning my final product. I'm definitely a product knitter, too. I love having THINGS when I'm done! It's like winning a trophy every time. That's all fun, but I really love it when I can find a project with less than 10 finished objects on Ravelry. Why? I think it's the excitement of finding something that seems obscure. I like being able to say, "Hey, have you seen this?" to my knitting friends. With fewer FO's, I feel like my brain is more flexible on yarn choices, too, because seeing a great FO in a great yarn just makes me want to run out and get the same thing, instead of thinking through fiber and color choices for myself. 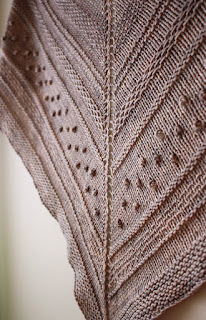 The downside is that I depend on the designer to have some great photos to get my excited about the pattern. Look at that! No, really! Look! 2) But it's not a shawly shawl. There's no lace, there's no foof, it's clean but has excellent texture. It calls for WORSTED YARN, people. WORSTED. 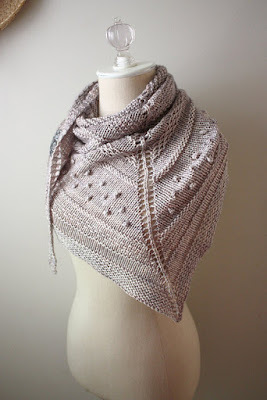 This is the Texelle Chunky Shawl by Phydeaux Designs. Look at that. It's beautiful in its simplicity, but has enough variation in the stitches to be an interesting knit. 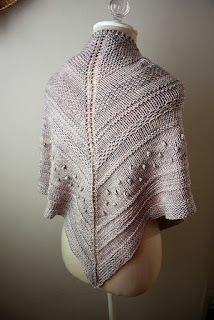 Brenda Lavell, the incredibly talented designer, chose Madelinetosh Tosh Vintage for the shawl, which makes a beautiful fabric without overwhelming the pattern. This is definitely not a multicolored yarn showcase. It looks so appropriately autumnal that I can easily see it being beautiful in jewel tones. I could even see- if one was feeling a bit saucy- some of the textured stripes in a different color. As with all patterns I love on Rav, this one has some great pattern notes, which let you know all the info up front without surprises. Check out the pattern's Ravelry page.